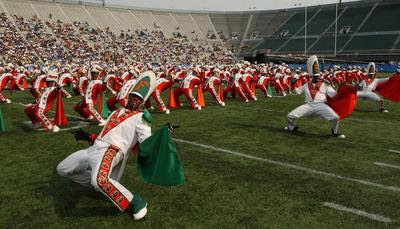 As a FAMU alumnus, I honestly cannot imagine a football game without the band. It's just not something I can wrap my mind around at the moment. I'm not trying to excuse or minimize the events that led to the suspension of the band, but it's just hard for a person that bleeds Orange and Green to imagine the possibility. Dr. Ammons did the proper thing in suspending the band after the tragic death of Robert Champion. I stand in full support of his decision. It's just going to take me a little longer to imagine going to homecoming or the Florida Classic without the band shutting it down. Florida A&M University is trying to figure out what types of entertainment it can offer during halftime shows if the school's famous marching band remains suspended this coming fall. The band, which has been suspended indefinitely since the hazing death of drum major Robert Champion in Orlando on Nov. 19, is a major draw for crowds attending football games such as the annual Florida Classic football game. Fans often joke that they go to the Classic, which is held in Orlando and is one of the university's biggest fundraisers, more for the energetic marching band performances than for the game itself. University leaders said Wednesday they do not know when they will decide whether the band will be allowed to perform during the fall 2012 semester. Meanwhile, FAMU's director of athletics, Derek Horne, said the university has to consider a replacement should the band not be allowed to perform in halftime shows. Horne said he is not sure yet what types of entertainment might replace the band. But the issue will be a major one for FAMU as it figures out how to boost athletic funding and fundraising at a time when that department is facing a financial shortfall. FAMU, Horne said, will be urging alumni, fans and others to go to games to support the university — regardless of what's going on during halftime. "This is a good opportunity for all of us to come together," Horne told me during a break at a board of trustees meeting this morning. "When the university puts on something, we need to be prepared to support it." FAMU President James Ammons said he does not know yet when he'll make the call on whether to reinstate the band. The university is awaiting the results of several investigations connected to the band. Law enforcement officials recently forwarded their investigation into Champion's death to the Orange-Osceola State Attorney's Office. The Florida Department of Law Enforcement is still investigating possible fraud involving travel per-diem payments to people affiliated with the band. The State University System is also looking into whether FAMU followed its own policies to stop hazing prior to Champion's attack aboard a parked bus. "We've got to get the information from the investigations," Ammons said. "That information will be critical." While the university awaits that information, it is considering changing its anti-hazing policy to encourage more people to come forward about hazing. On Thursday, trustees will discuss requiring students, employees, volunteers and even vendors to report any hazing activity they learn about to the campus police department within 24 hours.